After so thoroughly enjoying Eleanor of Aquitaine, I was eager to learn more about the royal consorts ruling medieval Britain. 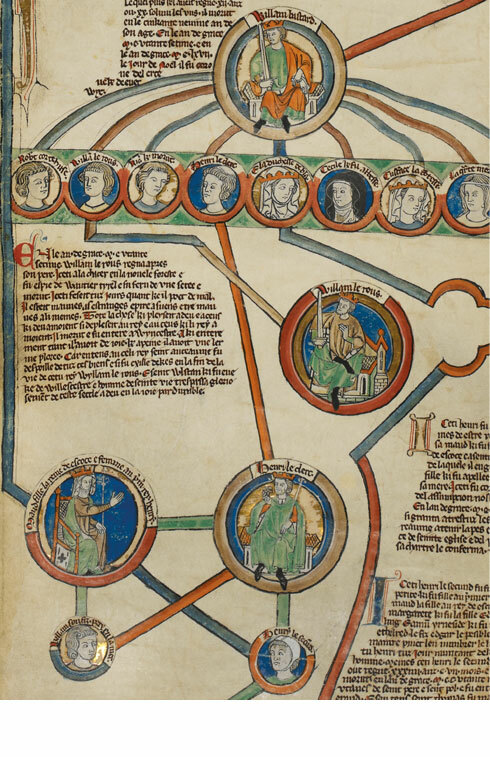 Thus The Deeds of English Kings by William of Malmesbury made for a wonderful follow up as it laid the foundation of the monarchs and events building up to Eleanor’s time. 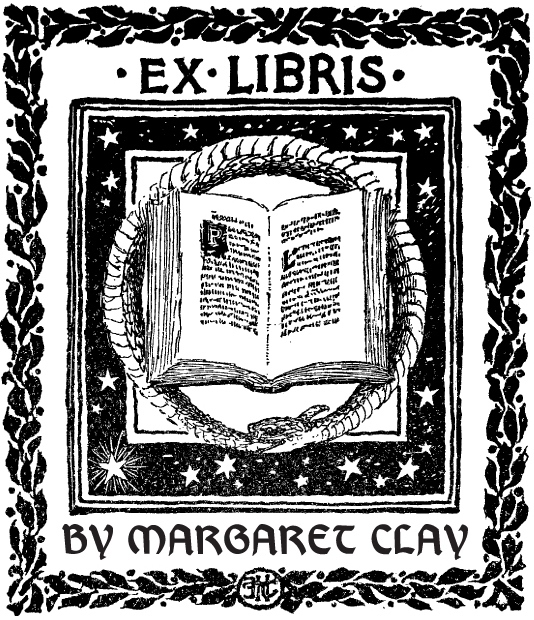 Even more interesting is that the author was Eleanor’s relative contemporary– the librarian of Malmesbury Abbey in the early 12th century– and at Queen Matilda’s prompting (Eleanor’s mother-in-law), he embarked on the ambitious task of compiling a history of the English kings from the first arrival of Saxon invaders up to the contemporary monarchs. 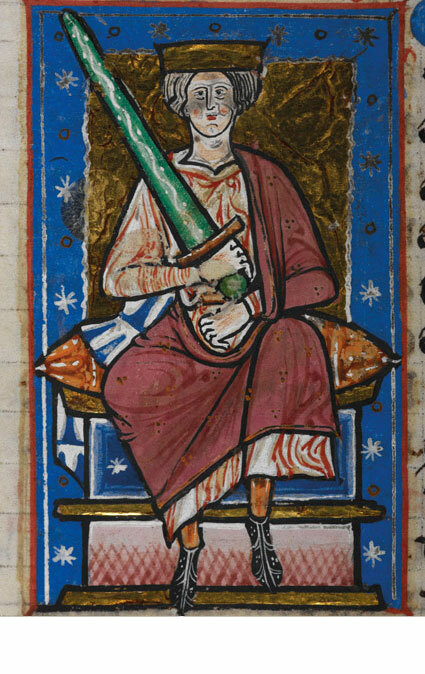 William had a unique perspective on British history as his father was Norman and his mother English, and the Norman Conquest of 1066 was still a recent event in the minds of many at the time. His work involved extensive first-hand research, and he did not hesitate to include some incisive disapproval of several Norman kings, an audacious move in that time. Deeds was first published in five volumes in 1125 and is considered to be the finest historical work of 12th-century England. He writes in both a patriotic tone, which was a reflection of classical Roman historiography, as well as a religious one. For example, in his account of the Norman Conquest, both of these assumptions are evident as the pious Normans win the victory, and English defeat results from their own sinfulness. However, couched in classical rhetoric are still laments of Britain’s loss of freedom under the Normans. Moving into the relative modern era, in comparison with the kings examined by William in Deeds, I then turned to a biography on Richard III, outlining the life of the controversial leader who was both the last king of the House of York and the last of the Plantagenet dynasty, as well as one of Shakespeare’s famous villains. 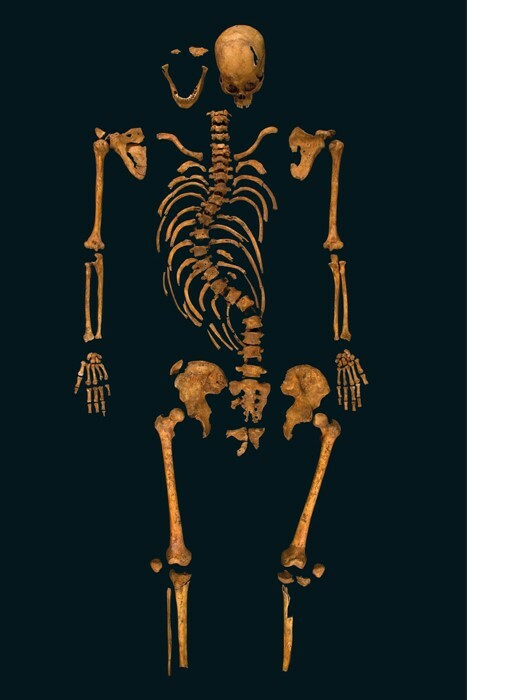 Known as the ‘Heathcliff of English Kings,’ Richard III has always been the subject of passionate debate, especially since the discovery of his skeleton in 2012 brought his name back into the public eye. As Desmond Seward writes in this insightful biography, Richard casts ‘a strange spell’ on academics, authors and the popular imagination. The author himself is no exception, writing in the preface to this edition that he had been “enthralled by him” since he was young. While initially drawn to the revisionist view, which lessens or negates Richard’s alleged crimes, Seward finally became convinced of the truth of the traditional version of Richard’s ascension to the throne. There are two conflicting views of Richard III– one is the traditional view of Shakespeare’s malicious antihero who murdered “The Princes in the Tower” and was of one of the most ruthless adventurers in all of English history. The other is the revisionist perspective of a handsome hero who did no such thing but was vilified by Tudor propaganda. Both of these Folio editions are dazzling volumes. In Richard III: England’s Black Legend, Thomas Penn writes an introduction that puts Seward’s account in context with the traditional and revisionist perspectives. Also included are beautiful portraits of the primary characters in the text, photos of Richard’s now famous skeleton and the type of weapon that killed him, etc. Deeds contains full-page illuminations depicting dramatic moments from the history it contains, all sourced from medieval manuscripts. Initial letters have been hand-drawn by the calligrapher Charlotte Orr, each one unique. Display fonts and chapter headings are picked out in rubric, while even the deep lower margin is a reflection of the original layout’s ‘golden rectangle’ design. The edition also features gilded top page edges. The result is a beautiful, modern reflection of the distinctive artistry of medieval manuscripts. 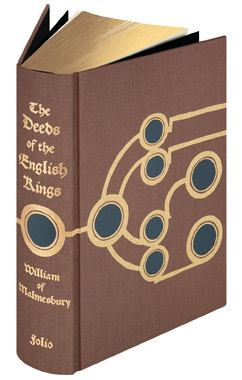 Buy The Deeds of English Kings here and Richard III here. 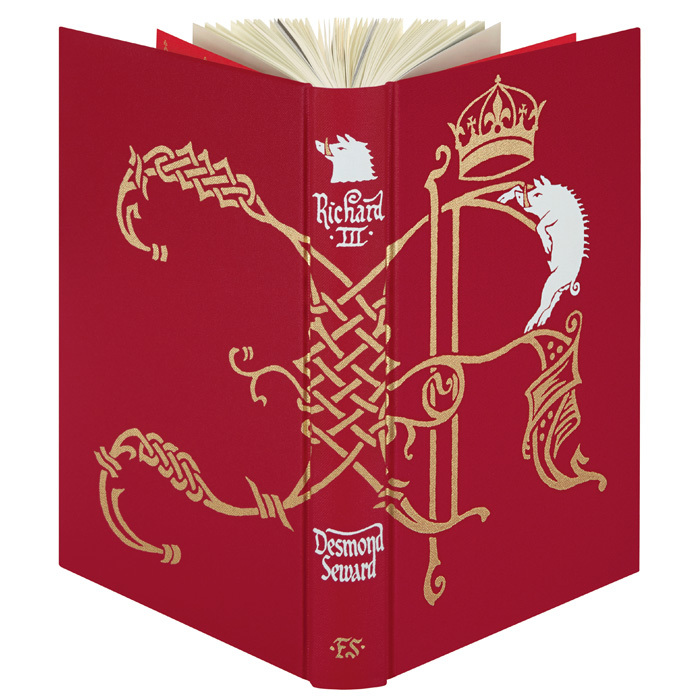 Illustration from The Folio Society editions.